What makes The MTA different is our ability to prepare you to be at a truly industry-ready professional standard in just 2 years. That’s why The MTA’s fast-track programme is staffed by passionate professionals who have already achieved success and are now focussed on giving you the skills to realise your ambition. 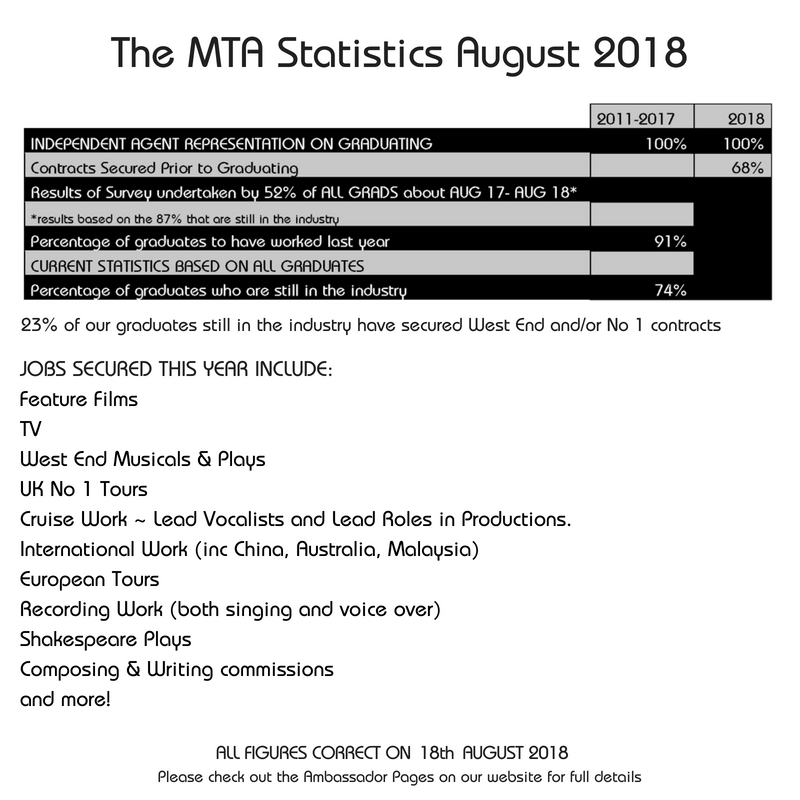 Our thorough approach, including a day-long audition process, which includes written feedback to all applicants, has earned The MTA the reputation of being ‘rigorously professional’. To date 100% of applicants have felt that The MTA audition day has been exceptional value for money. Of our 8 graduating year groups 100% of our students have left college having secured independent agent representation. 98% of our graduates have worked professionally since graduating. Check out the table below for the latest statistics for this year (please click on the picture to avoid eye strain). All of our 2018 graduates had secured INDEPENDENT agent representation 3 months prior to Showcase/Graduation. Also check out the Ambassador pages to see what EVERY graduate is up to. The MTA has an award winning, pioneering approach to pastoral care – as written about in this blog by the Principal. We are the only UK college to operate ‘a college for life’ policy – ensuring an ‘aftercare’ service unsurpassed by any other college. This includes ongoing pastoral and professional support, and free classes. We are the only UK college to do public performances EVERY term. Go to our You Tube channel to see us in action. Apply to the MTA Today! The MTA London Ltd is a registered charity. The Board of Trustees currently consists of, Annemarie Lewis Thomas, Lauren Austin & Samantha Hull. The latter two are both inaugural ambassadors for the college, ensuring that the college stays true to its ethos at all times. The Board is chaired by Producer and Consultant Jim Zalles.